Hamrick imparted to his music a distinctive voice that recalls the earliest American composers while embracing a fluid melodic style and expansive chordal palette all its own. He wrote hundreds of shape-note songs across a sixty-year period, contributing some of the most popular and well-loved songs to The Sacred Harp, and consenting to have some 179 of his songs published in two editions of The Georgian Harmony. Hamrick’s singing voice was renowned, an accurate bass singer with a warm and round tone. Hamrick harbored an unquenchable curiosity—he collected rare tunebooks, studied the history of the tradition’s songs and composers, and asked and answered questions about the music’s practices in the groundbreaking articles he wrote for Sacred Harp newsletters and scholarly journals. Hamrick was a gracious and generous mentor and a friend to many. He shared his knowledge of Sacred Harp’s history, his insight into composition, and his thoughtful opinions with singers young and old over decades. 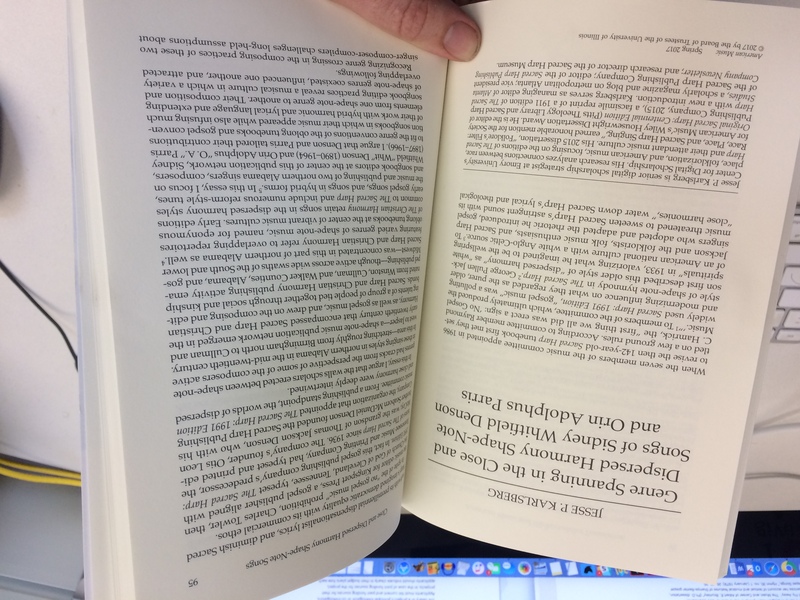 My essay on Hamrick, who was a mentor to me, serving “as a gracious and humble model for combining enthusiasm for Sacred Harp singing and composing with research into its history and practices,” as I noted in my dissertation’s acknowledgments, appeared in the Newsletter‘s first special issue. “Raymond C. Hamrick on The Sacred Harp,” special issue of the Sacred Harp Publishing Company Newsletter. “Raymond Cooper Hamrick on The Sacred Harp,” which I edited, “includes insightful essays by Hamrick himself, a video interview, and commentary on his many contributions to the Sacred Harp world.” The collection includes seven essays by Hamrick himself. Two of these, a masterful study of tempo and an insider’s account of the process of editing The Sacred Harp: 1991 Edition, were never before published. A short video of Alan Lomax and Hamrick in conversation recorded in 1982 had also never been published before appearing in the Newsletter. Hamrick’s unique dedication to studying and writing about Sacred Harp history and practices has largely escaped singers’ attention and was invisible to scholars unwittingly building on the foundations established by his research. I’m excited that this special issue brings Hamrick’s writings together in a single place, and grateful to have had the opportunity to draw attention to his fascinating findings and to his spirit as a person. I am also grateful to the large team of volunteers, Hamrick family members, and librarians and editors, named in my introduction, who made this issue possible. Cath Tyler leads at a Sacred Harp singing in Utrecth, The Netherlands, August 30, 2015. Photograph by Jesse P. Karlsberg. Bobby Watkins and son Taylor sport seasonal outfits at the 2014 Henagar-Union Convention. Photograph by Martha Beverley. [some] songs do indeed show a measurable and statistically significant burst in popularity at specific times of the year. Yet the reasons why some songs are led seasonally vary, as do the specific contours in the leading patterns of such songs over time. [This analysis] reveals just one small piece of how … [leaders’] individual discrete decisions build over time, shaping the seasonal ebb and flow of our collective experience. In addition to these two articles, this new issue of the Newsletter—which I edit with Nathan Rees—includes articles on a 1924 Sacred Harp trophy from Mississippi, a Sacred Harp singing weekend in Sweden, conducting Sacred Harp research online in historical newspapers, a 1965 list of “dos and don’ts” by Nashville minister and Harpeth Valley Sacred Harp News editor Priestley Miller, and much more. You can access the full issue at the Sacred Harp Publishing Company website. I coauthored an essay on Elphrey Heritage, a Philadelphia bookkeeper who was the sole northern contributor to nineteenth-century editions of the Sacred Harp tunebook. Christopher Sawula and I uncovered new details about Heritage’s life and work that help explain how his music came to be included in the book. I introduced and annotated this issue’s “Just a Minute” feature: an 1880 memorial to Sacred Harp co-compiler B. F. White included in the minutes of that year’s Chattahoochee Musical Convention. Finally, I wrote a “brief history” of Joseph Stephen James’s 1904 A Brief History of the Sacred Harp. Singer David Saylor recently donated a unique copy of this rare book to the Sacred Harp Museum. I discussed the unusual history of this particular copy and the broader significance of the book. Our issue opens with three writers exploring transatlantic Sacred Harp connections from different angles. Álvaro Witt Duarte’s account of the first Germany Sacred Harp Convention documents an important milestone for European Sacred Harp—and a moving and energetic weekend. Ellen Lueck writes from a broader viewpoint on the recent spread of Sacred Harp singing across the Atlantic. Singers who have wondered about what Sacred Harp is like in Europe will be interested to read her thoughtful observations about these dedicated communities far from the singing’s homeland. Chris Brown takes a historical perspective, investigating nineteenth-century English manuscripts to document thesurprising flow of New England hymn and fuging tunes across the Atlantic long before most historians assumed this ever happened. Jesse P. Karlsberg and Christopher Sawula share another tale of music traveling long distances, revealing the fascinating story of how Elphrey Heritage, a Philadelphia bookkeeper, became the sole northern contributor to the 1870 Sacred Harp. We turn from nineteenth-century printing to cutting-edge technology in Clarissa Fetrow’s review of “FaSoLa Minutes,” an iPhone app for searching Sacred Harp songs, singers, and singings. The latest installment of our series on the stories behind our singings’ minutes reprints the 1880 memorial in memory of Sacred Harp co-compiler Benjamin Franklin White, with new commentary on the text’s historical context. Concluding the issue, Nathan Rees reports on the recent digitization of the Sacred Harp Museum’s collection of open-reel tapes, and Jesse describes a rare copy of Joseph Stephen James’s A Brief History of the Sacred Harp, recently donated to the Sacred Harp Museum. Nathan Rees and I presented on the Sacred Harp Museum at the Association for Recorded Sound Collections in Chapel Hill, North Carolina. Online exhibitions: Nathan Rees is curating a new exhibition on the first National Sacred Harp Singing Convention, which will be launched on the Sacred Harp Museum’s website to coincide with the thirty-fifth National Convention this June. The exhibit draws on the Museum’s collection and new interviews with Sacred Harp singers, to document the motivations behind the founding of the convention, and its structure—modeled on the earliest nineteenth-century conventions, yet reflective of the transformed 1980 Sacred Harp landscape. The Sacred Harp Publishing Company Newsletter: The Newsletter, which I edit, assisted by Nathan, publishes both newly written accounts of Sacred Harp singings and singers, new research into Sacred Harp’s history by contemporary singers and scholars, and newly digitized historical documents drawn from the museum’s collection. Some of our most compelling articles have paired historical documents with writing from contemporary singers who experienced the events discussed, or who are undertaking projects now that relate to the older articles. Oral History interviews: I’ve been conducting interviews with Sacred Harp singers across Alabama, Georgia, and Texas this spring as a Berea College Sound Archives Fellow, assisted by Nathan Rees, Lauren Bock, and Richard Ivey. These discussions have focused on interviewees earliest memories of singings, senses of how singings have changed over the course of their lives, and thoughts about what their participation in Sacred Harp singing has meant to them. These interviews have inspired us to launch a Sacred Harp oral history project, aimed at collecting copies of recordings of interviews with Sacred Harp singers conducted in the past, and encouraging singers to record new interviews with singers in their areas. We hope to officially launch this new project this summer. The Association for Recorded Sound Collections conference was a great place to present on this work, and to learn about best practices for digitization, preservation, and access on a shoestring budget. I attended a pre-conference workshop called “All Things Digital: Managing Digital Audio Collections”—an opportunity to learn more about how to approach better preserving the Sacred Harp Museum’s collection. Nathan and I also benefited immensely from conversations with conference attendees from government agencies such as the Library of Congress and Smithsonian Institution, numerous university libraries and archives, and record companies. Michael Graves of Osiris Studio, an audio engineer who is presently digitizing twenty-two reel-to-reel tapes in the Sacred Harp Museum’s collection, was also present. We are in the earliest stages of this work toward better preserving the museum’s collection and making it accessible. It was invigorating discuss this work with such a supportive and informed audience. The sixth issue of the Sacred Harp Publishing Company Newsletter features stories about key figures and events from Sacred Harp’s history and celebrates the Sacred Harp Museum’s rich collection of songbooks, papers, and recordings. Our issue begins with company executive secretary Karen Rollins’s and vice president Jesse P. Karlsberg’s tributes to 2014 posthumous citation award recipients Jeff and Shelbie Sheppard. Matt Wells follows with the second installment of our series telling the stories behind the more unexpected moments reported on in the minutes, writing about his and Lara Andersen’s “surprise wedding” at the 2002 Minnesota State Convention. Karen Freund shares excerpts from a conversation 2013 citation award recipient Jerry Enright recorded with Lookout Mountain singer Barrett Ashley about his lifelong love of Sacred Harp singing. Another article features a speech by music educator Irving Wolfe on Sacred Harp scholar George Pullen Jackson’s contributions to our music, which was printed in the minutes of the 1965 United convention. Charlotte Wolfe, Irving’s daughter, introduces the speech with memories of her father’s involvement in Sacred Harp. Rebecca Over shares new findings about the life of Sacred Harp composer Lee Andrew McGraw, shedding light on the role Sacred Harp played in the lives of singers during early decades of the twentieth century. Finally, Nathan Rees reports on a recent donation of a rare 1909 edition of The Sacred Harp to the Sacred Harp Museum and a new initiative to digitize and make available rare and significant items in the museum’s collection. A downloadable PDF of J. L. White’s 1909 The Sacred Harp, Fifth Edition, recently donated to the museum and digitized by Charles Whitmer. As always, we encourage you to leave comments on these new articles and to write us with your feedback and suggestions of topics for future issues of the Newsletter. The fifth issue of the Sacred Harp Publishing Company Newsletter recounts the extraordinary lives and achievements of significant figures across Sacred Harp’s history and presents new insights drawn from the minutes of Sacred Harp singings. Our issue begins with Sacred Harp Publishing Company Executive Secretary Karen Rollins’ remembrance of the four 2013 recipients of posthumous citations from the company: Harrison Creel, Jerry Enright, Lonnie Rogers, and George Seiler. Two additional pieces focus on one of the first recipients of a Publishing Company citation, singing school teacher, composer, and Publishing Company co-founder Thomas Jackson Denson. Company President Michael Hinton recounts family stories about “Uncle Tom” Denson, his grandfather, and introduces an account by Denson’s son Howard of his father’s last lesson, at the 1935 United convention. Another article collects letters of condolence written by prominent singers to T. J.’s other son, Paine, in the wake of Denson’s death. Harry Eskew recounts the contributions of nineteenth-century composer, arranger, and songbook editor William Walker, and in an excerpt from a 1964 speech, Hugh McGraw addresses some common criticisms of Sacred Harp singing and describes the state of the tradition in the mid-1960s. Turning to the present, Cheyenne Ivey contributes an account of the eventful trip twenty-two Sacred Harp singers made to Washington, D.C. this fall to join 2013 NEA National Heritage Fellow David Ivey in a celebratory concert. Two additional articles mine the Minutes of Sacred Harp Singings. Nathan Rees shares the story of M. B. Forbes and his harmonica, and Jesse P. Karlsberg, Mark T. Godfrey, and Nathan Rees draw on minutes data from 1995–2013 to measure the effect of Cold Mountain on our singings. We invite you to leave comments on these new articles and to write us with your feedback and suggestions of topics for the future. The recently-published fourth issue of The Sacred Harp Publishing Company Newsletter leads off with Sacred Harp Publishing Company President Mike Hinton’s story about the items tucked into the Bible of his aunt, beloved Sacred Harp singer Ruth Denson Edwards (1893–1978). 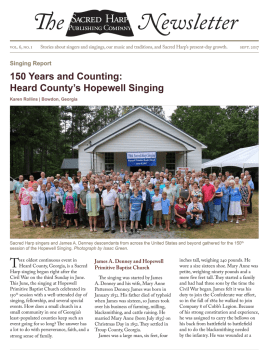 Buell Cobb shares memories of singings at the Cullman County Courthouse, and an article reprinted from the January 1986 issue of the National Sacred Harp Newsletter features Lonnie Rogers’s and Joyce Walton’s account of a bus trip to the 1985 New England Convention. Another article reprinted from the same issue of the National Newsletter shares Raymond Hamrick’s findings on how singers pitch Sacred Harp music. We have paired it with a new introduction by Ian Quinn, who has recently conducted an extensive study on the same subject. Reports on Sacred Harp singing today in this issue of the Newsletter include Justyna Orlikowska’s account of a month-long trip that took her to the Ireland, Western Massachusetts, and Georgia State Conventions; an essay by Rachel Hall on the making of The Shenandoah Harmony; and an account of the informative and death-defying trip Jason Stanford took to a singing school in South Georgia with Hugh McGraw and Charlene Wallace. The new third issue of The Sacred Harp Publishing Company Newsletter documents an important chapter in the continuing spread of Sacred Harp singing beyond North America, with singing reports on three Sacred Harp singing events held in Europe last September and on the first Australian All-Day Singing, held last October. Features in this issue of the Newsletter examine how aspects of Sacred Harp music promote the goals of harmony and unity through singing together, tell the story of the Beginner’s Guide to Shape-Note Singing, and relate new findings about Sacred Harp’s early history. In the wake of my trip last September to attend the seventeenth United Kindom and first Poland Sacred Harp Conventions and to teach at the first European session of Camp Fasola (held the week between these two conventions) I’ve continued to think and write about how Sacred Harp singers conceive of community, tradition, transmission, and place as the style spreads. Keith Macdonald expands on the history of Sacred Harp singing in Germany. Comment on the wall of the “Sacred Harp in Poland” Facebook group. Accessed 3/14/2013. In November I wrote for the Country Dance and Song Society News on how these September singings “facilitate[d] cultural exchange, … inspire[d] community, and forge[d] emotional and spiritual connections” among European and North American singers. My essay, “‘Come Sound His Praise Abroad’: Sacred Harp Singing across Europe,” attempts to contextualize these recent events by recounting the introduction of this music to various European countries since 2008. In a comment on Facebook, Keith Maconald helpfully expanded on my account of the early history of Sacred Harp singing in Germany, pointing to the role he and the late Jutta Pflugmacher played in arranging for the Sacred Harp singing schools that Michael Walker and Aldo Ceresa held in Germany in October, 2011 (see screenshot from Facebook at right). I’ve transcribed a portion of Macdonald’s important comment below. Jutta [Pflugmacher] had sung Shape Note while she was living in England and was very involved in organising cultural events in her home town of Büdingen. She organised a concert and workshop with Larry Gordon’s group in April 2010, where she met Keith Macdonald, who had recently moved to Germany and had also sung Shape Note in England. Together they decided to try to arrange further Shape Note music workshops in Germany, and were put in touch with Michael Walker through the UK shapenote website. Michael was an excellent contact, with a thorough knowledge of the German language, and he enthusiastically supported the plans; it wouldn’t have been possible without him. Sadly at this time Jutta became ill from cancer and was forced to take a back seat. Keith and Michael developed plans further for two workshops in Sacred Harp to be held in Würzburg and Frankfurt am Main in October 2011, under the superb tutorship of Aldo Ceresa. Members of the Bremen group travelled to Würzburg to participate in the workshop, and I am delighted that Jutta was able to participate in the workshop the following day in Frankfurt. Sadly she lost her fight with cancer shortly afterwards, but she stays in our memories as a key person in the story of Sacred Harp in Germany. Since then the Bremen group have gone from strength to strength, and a small group sings regularly in Frankfurt. In February I wrote for the Southern Spaces Blog on how the Sacred Harp events in Europe in September, 2012 “served as sites around which singers negotiated their associations of Sacred Harp singing with place.” My blog post—“Sacred Harp, ‘Poland Style’”—described how singers intentionally created what we described as a new “local tradition” of leading P. Dan Brittain’s song “Novakoski” with a time change from slow to moderate-fast at the start of the fuging section. The piece also noted how new singers from Poland and from Norwich in the United Kingdom have appropriated songs in The Sacred Harp bearing the names “Poland” and “Norwich” as symbols of their local Sacred Harp singing communities. My post was published the day before I left Georgia for another European singing trip, this time to Ireland for the third Ireland Sacred Harp Convention. Imagine my delight when the day after I arrived P. Dan told the story of “Novakoski,” “Polish Style” and led the song in the manner described above during his singing school the evening before the convention. Later, during the convention itself, a group of Polish singers led “Poland” and a group of singers from Norwich led “Norwich.” Quod erat demonstrandum. Earlier in February I spoke about Sacred Harp in Europe at a conference titled “Southern Sounds/Out of Bounds: Music and the Global American South” held at the University of North Carolina, Chapel Hill and organized by the university’s Center for Global Initiatives and Center for the Study of the American South. My paper, “Digital Transmission and Mutable Tradition among European Sacred Harp Singers, 2008–2012,” addressed how European singers have supplemented transmission through travel to singings in the United States with reliance on digital resources such as YouTube videos shared through Facebook, and described how these singers are attempting to strike a balance between adhering to what they see as “traditional” practices while adapting Sacred Harp to new local contexts. In addition to my two short essays and conference talk, two other short pieces on the Sacred Harp singing events in Europe last fall have recently been published. Gosia Perycz and Fynn Titford-Mock each contributed singing reviews on these three events to the Sacred Harp Publishing Company Newsletter. Their essays: “A Hollow Square in My Homeland: Bringing Camp Fasola to Poland” and “Celebrating Sacred Harp in Europe, September, 2012” describe the U.K. Convention, Camp Fasola Europe, and the Poland Convention in detail and are well worth a read.